This article is a step by step breakdown on how to set up custom pickup and return locations. This is so that your customers are able to key in the location that you can deliver your vehicles to. Firstly, navigate to Settings > Car Rental. Here, select “Yes” under “Allow Custom Pickup Locations” highlighted in orange in the picture below. Next, on the same page, scroll down till you reach “Default Values”. Here, select “Yes” under “Enable Address Autocomplete for Custom Pickup Location” highlighted in orange in the picture below. What this does is that it uses Google Map’s API to help your customer to type in their exact address. Thirdly, navigate to Settings > Car Rental > Text Settings tab. 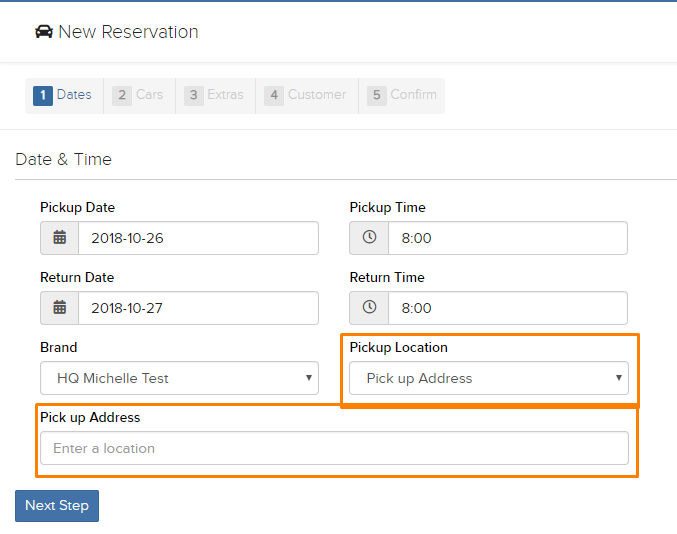 Here, under “Custom Pickup/Return Location Label” is what you would change to notify the customer that they can type in a custom address here. It is shown, highlighted in orange in the picture below. If you would like to charge your customer extra for the custom pickup and return locations, you would first need to create an additional charge which you can learn more about here. Make sure that the fields “Hide From Reservations” and “Show on Website” in the Additional Charge you’re creating is set to “No”. Then, in Settings > Car Rental under Additional Charges section. 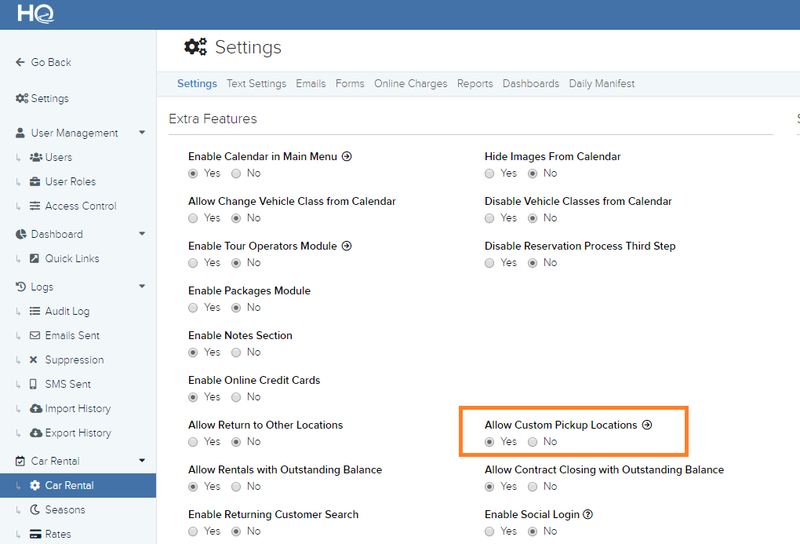 Select the Additional Charge that you created under “Additional Charge for Pickup on Custom Locations” and “Additional Charge for Return on Custom Locations” highlighted in orange in the picture below. Once you have done all the steps above, on step one, you will see the additional location in Step 1 which your customer can key in their address as shown in the picture below highlighted in orange.